AMC has a Walking Dead marathon lined up for this Saturday night, in anticipation of the Season 4 finale, which will air Sunday, March 30 at 9:00 p.m. The official episode description for "A" doesn't give us a lot to go on in terms of what we might expect from the episode, beyond what was glimpsed in the preview. 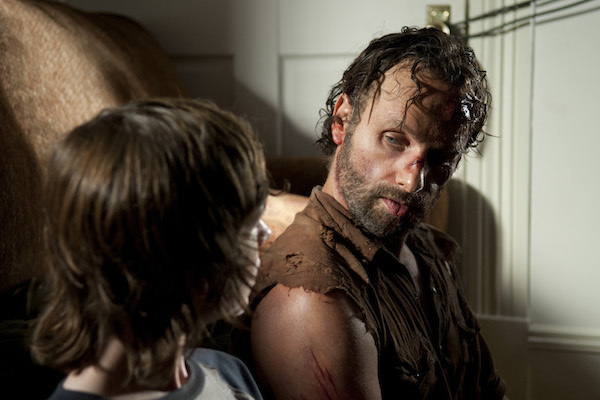 Nor do these two photos from the episode, one of which shows Carl with a smudge of blood on his face, and the other shows Rick looking bearded and a little scratched up. 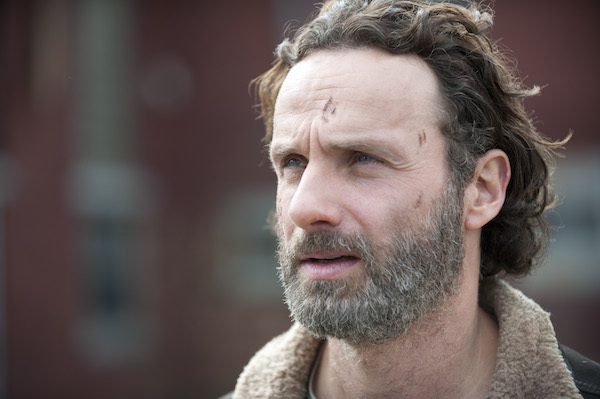 Scratched up is nothing by comparison to how grimy Rick Grimes looked at the start of the second half of Season 4. Remember this Rick? Current Rick is looking much better now than he did when he was griming it up in that house while Carl chowed down on pudding. AMC's official episode description for "A" is, "as multiple paths collide, Rick comes face to face with sheer brutality. Will he and the group have what it takes to survive?" Although, I think the mention of "sheer brutality" implies that Rick's biggest challenge will be of the living variety as opposed to the undead. As menacing as the walkers are in The Walking Dead, I'd apply the word "brutal" to something more living and intentional. And that would certainly apply to Joe and his violence-loving band of not-so-merry men. We know from the conversation that Joe had with Daryl that they haven't forgotten what Rick did, killing one of their guys and setting him loose on the rest of the house. Of course, if those guys hadn't proven just how brutal they could be, what with their "claimed" culture and all that, Rick might've been able to mosey on out of there without having to go to such extremes, but that's probably a moot point at this point. Whether or not his actions come back to haunt him remains to be seen this Sunday night! Meanwhile, as mentioned, AMC will be hosting a Season 4 marathon -- all 15 episodes to date, back-to-back -- starting Saturday, March 29 at 8:00 p.m. ET. Those episodes will air leading up to the finale Sunday, March 30 at 9:00 p.m. ET/PT, after which the finale of Talking Dead will air at 10:00 p.m. Andrew Lincoln and The Walking Dead executive producer Scott M. Gimple will be the guests so don't miss that! In the meantime, read our breakdown of last Sunday night's episode of The Walking Dead, "Us" here.